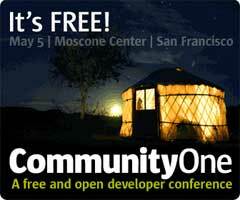 I just wrapped up JavaOne this year, but I flew in too late to catch the second annual CommunityOne Conference on Monday, which is more or less a free one day version of the JavaOne conference. You can attend general session talks, panels, and technical sessions just like JavaOne but for free! General session videos are recorded and available online for those who couldn’t attend. Technical sessions are also available online for free as pdfs. Reference my previous post Essential Firefox Add-Ons for a quick way to download all the pdfs in one click using DownThemAll! and Firefox on this link which lists all the sessions. Find more on JavaOne here soon as I process all of my notes this week!